"As the old joke goes, these Russian tea cakes might not be Russian, but at least they're not cakes. 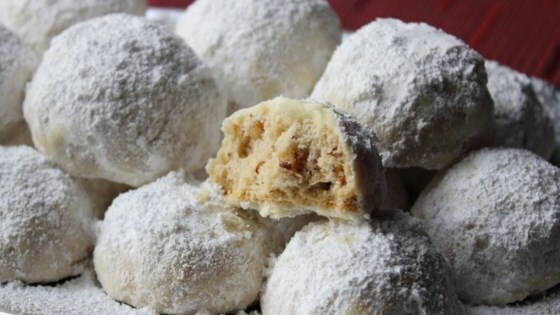 No one knows exactly how these came to be known as Russian tea cakes but, nevertheless, they are quite delicious." Preheat oven to 350 degrees F (175 degrees C). Arrange rack in center position of oven. Place butter, 1/3 cup packed powdered sugar, walnuts, salt, and vanilla in a bowl. Top with the flour. Mix with your clean hands until the dough starts to clump up. Keep mixing by hand until all the flour and clumps of butter are evenly mixed into the dough and it can be easily formed into balls. Scoop out dough and roll by hand into uniformly round balls, just slightly larger than 1 inch. Place on a rimmed baking sheet lined with a silicone baking mat about 2 inches apart. Bake in preheated oven until lightly golden, 15 to 25 minutes depending on the size of the cookies. Let cool exactly 5 minutes then roll in a shallow bowl full of confectioners' sugar. Let cookies cool completely and toss them again in the confectioners' sugar. The only tricky thing here is the baking time, since there are so many variables: the size of the dough balls, whether you use a silicone mat or parchment, how light or dark the sheet pan is, etc. These factors can all affect the final time significantly. I think this cookie tends to get under-cooked, and some recipes call for as little as 12 minutes at 350 degrees F (175 degrees C). I like these fairly golden, so I get that nice brown-butter flavor, and that took me about 20 minutes or so, which is why I gave such a wide range. Start checking at 15 minutes, and proceed from there. I have been making these for over 30 years. The name is the only difference--Mexican Wedding Cakes. My whole family love these little 'snow balls'. For a Christmas twist I added about an 1/8 tsp of peppermint extract and crushed peppermint candy. Everyone loved them. These were a huge hit!!! I gifted each of my children a dozen. I am not sure if they even made it home with the kids. These will be added to the annual Christmas Cookie list!! !